Apart from Santa’s magical reindeer there are many thousands more living in the forests and fells of Lapland who have not yet reached the standard for a joining the special magic team. 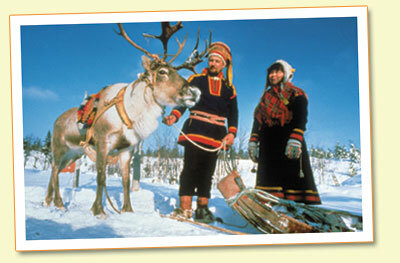 These are reindeer that were originally wild animals that the Lapps started to domesticate about 1,000 years ago. Reindeer calves are born between April and early May and the weight at birth is 5kg. During summer, the Reindeer owners get together to mark the calves. Each owner has his own mark, which is put inside the reindeer’s ear, and there are over 16,000 different marks in Finland. In the autumn, the mating season starts and the dominant male reindeer gathers a large harem. The total number of reindeer in the wintertime exceeds 200,000 heads and, during the summer, about 150,000 calves are born. Reindeer eat anything that is green including grass and birch tree leaves, as well as cloudberry flowers, berries and mushrooms. In the winter reindeer must find food by digging for lichen under the snow. They also eat moss that grows on trees but in reality most winter nutrition comes from the fat layer on their backs. 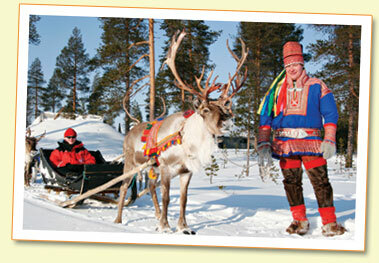 The Reindeer can run at a speed of 70km per hour but they can not maintain this speed for long. 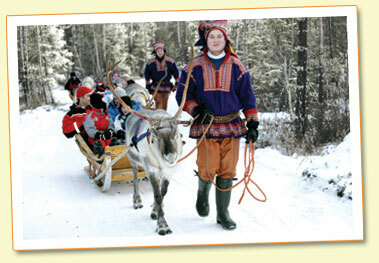 Some compete in reindeer race competitions. Twas the night before Christmas, when all through the house Not a creature was stirring, not even a mouse. As dry leaves that before the wild hurricane fly, When they meet with an obstacle, mount to the sky. So up to the house-top the coursers they flew, With the sleigh full of Toys, and St Nicholas too. As I drew in my head, and was turning around, Down the chimney St Nicholas came with a bound. A bundle of Toys he had flung on his back, And he looked like a peddler, just opening his pack. His eyes-how they twinkled! his dimples how merry! His cheeks were like roses, his nose like a cherry! He had a broad face and a little round belly, That shook when he laughed, like a bowlful of jelly! And laying his finger aside of his nose, And giving a nod, up the chimney he rose!